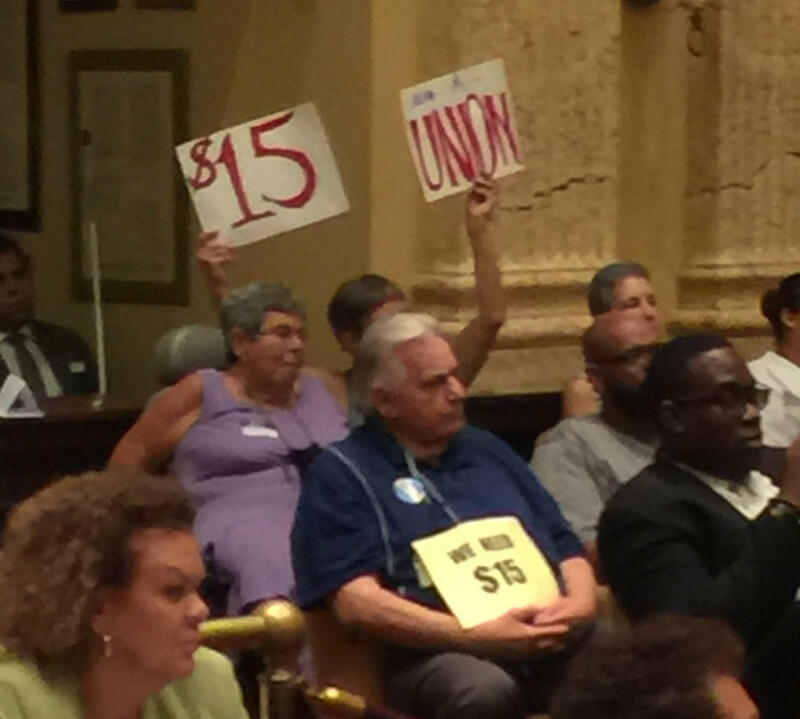 The Baltimore City Council sent a bill raising the city’s minimum wage to $15 an hour back to committee Monday. And it looks like it may not come back out before the next city council takes office in December. Councilwoman Mary Pat Clarke acknowledged that her bill almost died, but at the same time insisted it’s alive and well. “It’s safe in its nest in Councilman [Robert] Curran’s labor committee,” she said. Curran, who voted to send the bill back to his committee, said he would not let it out unless he was sure Clarke had the eight votes necessary to pass. And Clarke said she is willing to wait for a new council to take office before she brings the bill back. The union backed bill barely squeaked by a preliminary vote, 7-4, last week and it wasn’t clear if Clarke had rounded up the votes necessary for final passage Monday. Clarke, who moved to send the bill back to committee, said it would give backers a chance to fix a clause advocates feared may have allowed employers to pay disabled workers less than able bodied workers. The bill would gradually raise Baltimore’s minimum wage to $15 an hour by 2022. The state minimum wage of $8.75 an hour is to reach $10.10 by 2018. Council President Jack Young argued that raising the city's minimum wage to $15 an hour “puts us at a disadvantage” competing with neighboring jurisdictions for business. At the least, he said, neighboring Baltimore and Anne Arundel counties should join the city in the $15 an hour wage. Montgomery County is considering a similar increase. Ricarra Jones, a political organizer for 1199SEIU; one of the unions backing the bill, said they are not disappointed by the delay and are confident a bill will pass, even if they have to wait until December. But businesses are against the bill, citing what they called an already tough climate to operate in the city. Jason Rodriguez, who owns a chain of wireless phone stores in the city, questioned raising the minimum wages in a “stressed” business environment. He said he can’t afford the wage hike and that it would put him out of business.